A Crane Found and Replaced! I got an email from Andrea at the Tampa Bay History Center saying that they found Crane 388, Dainty! April 29th: "One of our staff members at the History Center found her a couple days ago and it just so happens that a few of our staff members are heading up to the American Association of Museums Annual Conference in Minneapolis/St. Paul, Minnesota tomorrow so we are sending her there! Thanks for visiting the Tampa Bay History Center Dainty, have a great flight"
Very exciting! I've never been to Minnesota. I'm get a little jealous that my crane it seeing places that I haven't before. But I was extremely pleased to get the following email from Manny who also works at the Tampa Bay History center. 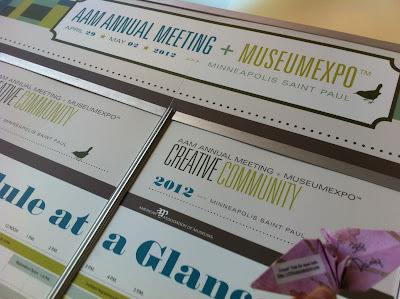 May 2: "She's at the American Association of Museums Conference in Minneapolis. I took the picture at the Minneapolis Convention Center on May 2 and I left her there at the conference hospitality booth. We’ll see if someone picks her up." Check out the point I put on the map to see Dainty's current placement! And thank you to the wonderful people at the Tampa Bay History Center for finding and replacing Dainty. Also, thank you fine folks for running a pretty interesting museum so that we could enjoy a lovely outing in downtown Tampa!